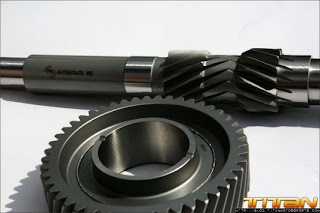 Titan Motorsports received the first set of 1st gear upgrades. PPG is a well known and respected gearbox, and gear builder from Australia. I have run a few sets of their gears in big power (900-1000whp) R32 and R33 GT-R's and I have liked them. With this upgraded first gear and first gear main shaft we expect the factory transmission to handle the abuse of hard launches allowing John to continue his record setting pace in Samurai Speeds quest for the first 9 second GTR. PPG is also working on a complete gear set for the GTR which should be available in the near future as well, we anticipate to stock both items for GTR owners looking to take their cars to the next level.